Last night was definitely warmer than the previous two nights. Being at a lower elevation certainly made a difference. 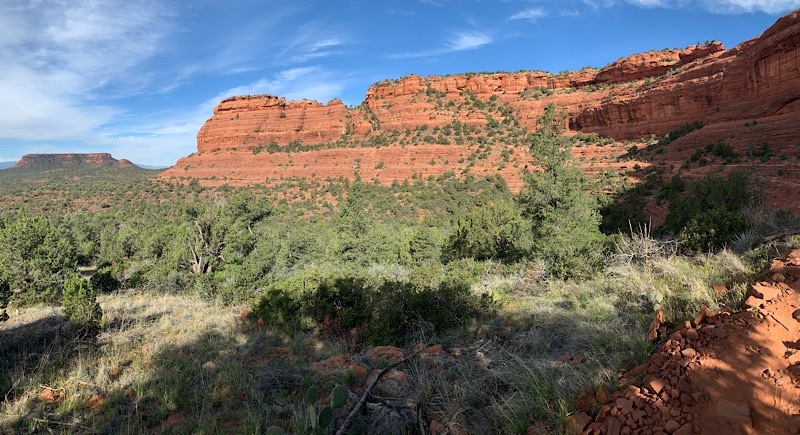 When we were packing up this morning, we heard a noise which almost sounded like a camp stove, which didn’t make any sense since none of us cook on the trail. We finally realized that it was a hot air balloon flying over us. Once we looked up, we could see five different hot air balloons floating across the sky. It was really cool for us to just watch them (almost) silently moving across the sky. The folks in the balloons must have really been thrilled as they were floating through an amazing landscape. 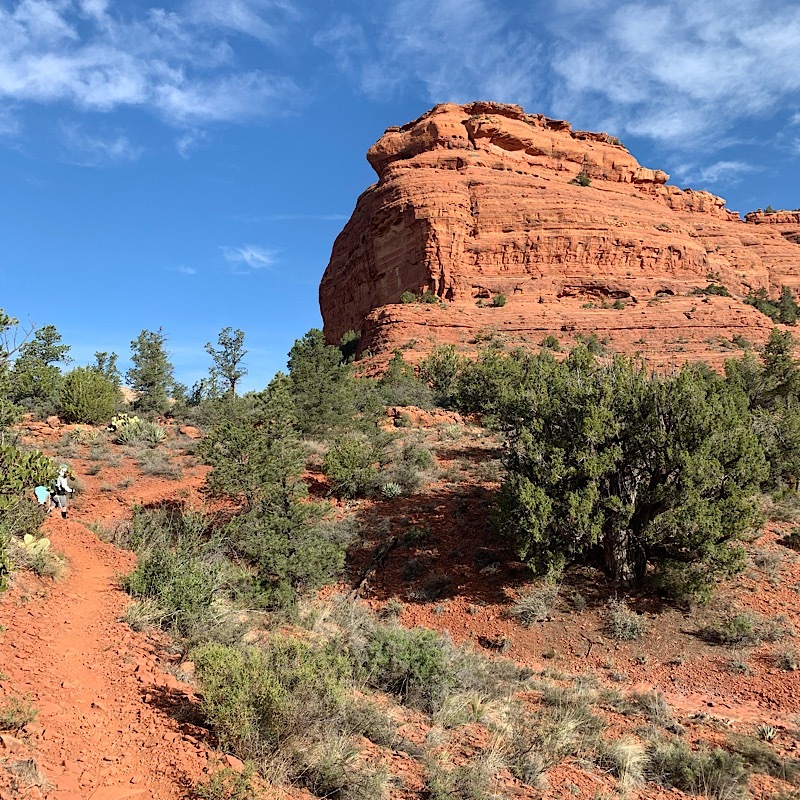 We were on the trail by 7am and since we were continuing on the well-built and maintained trails around Sedona, we were able to keep a good pace. 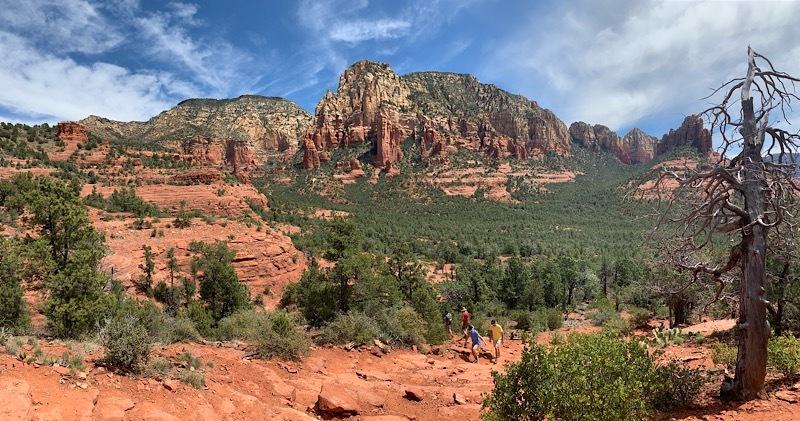 One of the trails this morning was called “Canyon of Fools” and was really quite neat, as it seemed like just a very narrow wash that is used by mountain bikers as their playground. We could see where bikes had made hard banks off the side walls and lots of extra humps they would ride over. 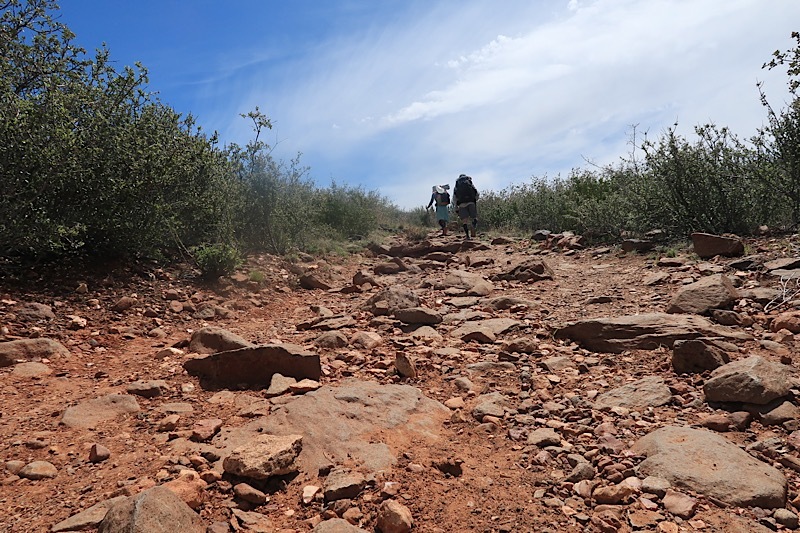 This trail led us up to a large red rock butte called Mezcal Mountain. The trail went about halfway up the butte and followed along the edge of the cliff. It was really scenic and beautiful out there. 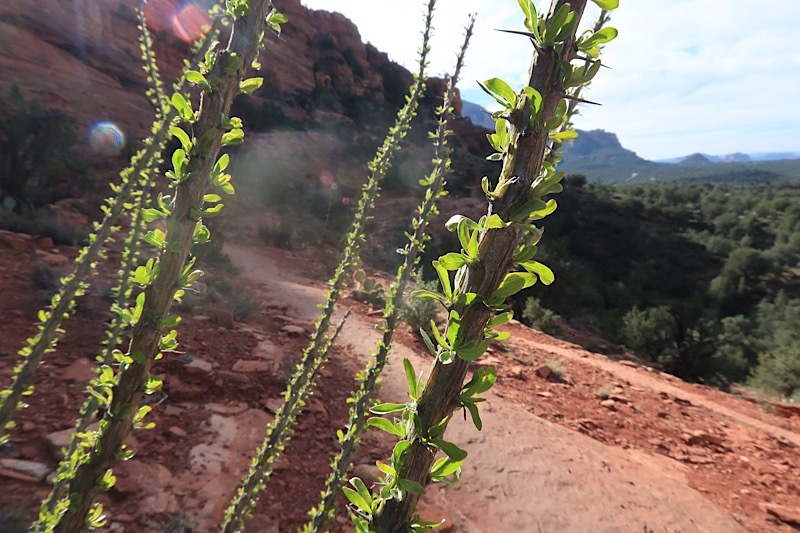 We are definitely loving the red rock landscape. Starting on Mezcal Mountain and continuing the rest of the miles into Sedona, we saw lots and lots of mountain bikers and day hikers. 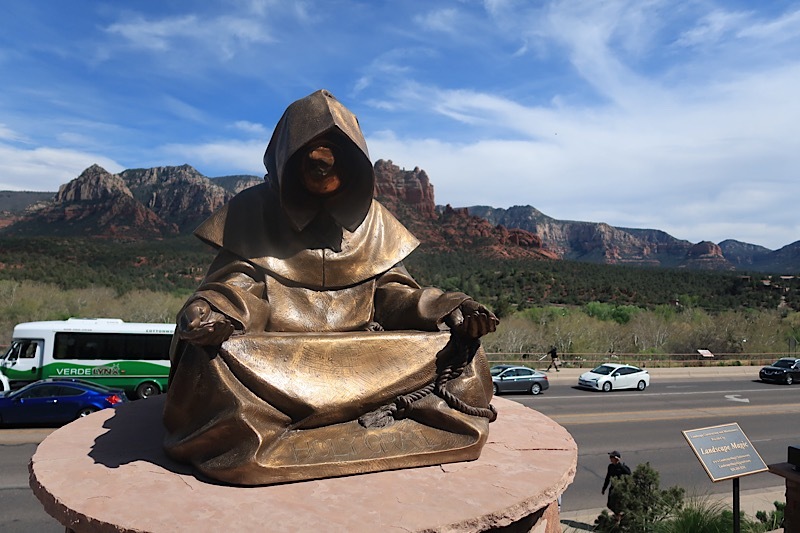 Without even seeing the bumper-to-bumper traffic in town, it was obvious that Sedona is quite popular. 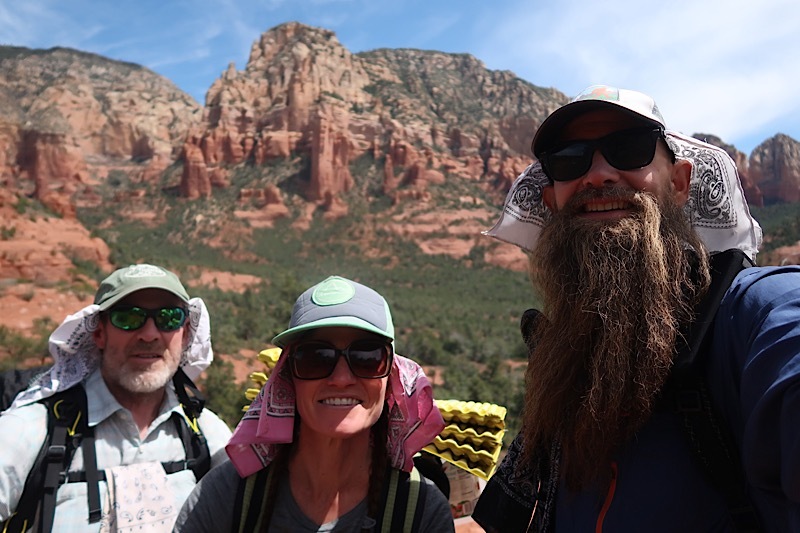 When we got to the Jordan trailhead, Beardoh turned on his phone and called us an Uber. Unfortunately, Uber had a hard time locating us at the trailhead, but eventually the driver picked us up and brought us in to Chipotle, where we got lunch and just relaxed for awhile. We currently have several hours to kill in town, as we wait for our friends, MountainMan and Ace, to arrive. They were flying in from Seattle to join us on the trail for the next five days. Unfortunately, their flight was a bit delayed, so they had to take a later shuttle. We’ll have to wait and see if we can do any miles on the trail tonight before it gets dark.